Hi everybody! 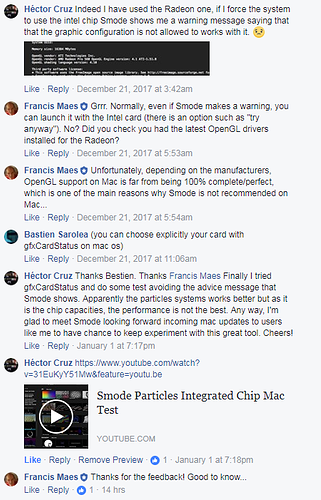 I´m pretty new user of Smode. I have installed the synth version on my new MacBook Pro (I know that Smode is designed to works better on Windows + nvidia) so, everything works fine but, all the compositions that use particles has a very strange behtevour because the particles appears just for a moments after it births, it can’t develop its expansion. Doy you know what kind of thing could be happen? Is it posible do something as a complementary installation to fix it? any idea? Do the particles flicker or they just freeze without movement? It might be a refresh rate sync issue. Thanks @Skinnytorus , the refresh rate sync sounds interesting. I going to attach to video as a reference of the problem, could be the easy way to explain it. Did you check your graphics card driver ?